This past week has been a whirlwind! Welcoming out of town family, baking, cooking, shopping and spending time together are all things I'm thankful for. I trust you had a blessed Thanksgiving too! I've joined a group of over 30 bloggers for the next four weeks, to celebrate and share all things Christmas! 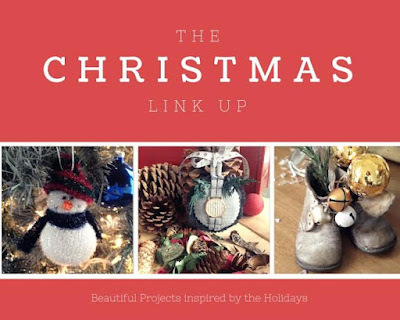 Each Friday in December we will be linking up some of our best Christmas projects and asking you to share yours in a giant link-up party, with a new theme each week! The best part for YOU is that you will have the opportunity to be featured and have your project seen on over 30 blogs! This week's theme is Christmas Trees. I love decorating table top trees because it's so quick and easy to fill them up and get a nice look. This Coca-Cola tree is new for this year. I filled it with plush polar bears, DIY painted ornaments (that project can be viewed here) and vintage Santas. Here is the same tree, decorated last year with vintage goodies and natural elements like real bird's nests. You can read more about it here. I would be remiss if I didn't include our large tree from last year. You will find the tutorial for the easy 'Merry Christmas' banner here. 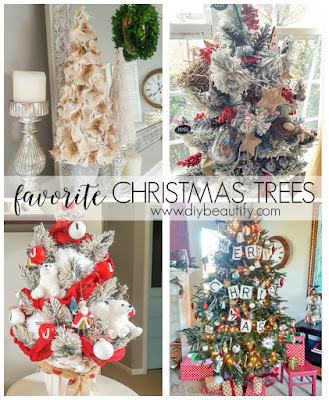 My favorite Christmas tree craft to date has to be my burlap trees. They are so easy to make, look great all year and add a rustic touch to my home. There you have it, my favorite trees to date. Now it's your turn to share your amazing Christmas trees and inspire us all! Read the rules and then scroll down for the linky. 1. Please link to a specific post on your blog, not your blog's home page. Up to 3 posts are allowed. 2. Please leave a comment for your host - remember, it's a party! 6. By submitting a link, you give us permission and grant us the right to feature your project and photos on this blog, website and on social media. We will always give proper credit and a link back to your post. Each week, a few of our favorites will be featured on our blogs. Features will also be pinned to our Christmas Link Up Pinterest Board for even more exposure! Be sure to visit some of these talented ladies and their blogs. You just might find a new favorite!